Red light camera "A" photo, taken as vehicle's rear wheels clear the stop line. Data box at top right of photo shows that the light had been red for 0.65 second. 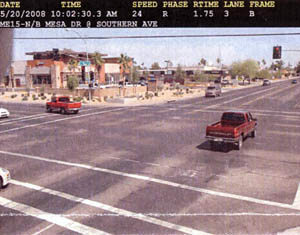 Red light camera "B" photo taken in mid-intersection. The light had been red for 1.75 seconds at this point. Our countermeasure products test required the construction of a red light camera that replicates the two prevalent U.S. systems, from Redflex Systems and American Traffic Solutions (ATS). We also noted the angle between the cameras and the vehicle's path, the most crucial factor in a plate cover's performance. Our red light camera system was set up next to a city street. We used a Nikon D70 DSLR with a 70-300mm Nikkor f/4.5-5.6 lens. The camera was located eight feet above ground, snapping a photo when the target car's back bumper was about 80 feet away. We used a Photogenic 600 WS strobe flash with a 7.5-inch-diameter reflector, mounted 10 feet above ground level. We duplicated the strobe flash using manufacturers' specifications, same with polarizing filter, shutter speed, lens focal length and other variables. We ran three sets of tests with each plate: one with the camera at 10 degrees, another at a 22-degree angle and the third at a 35-degree angle. A 10-degree angle between target path and camera is not uncommon among fixed speed cameras; a 35-degree angle is. 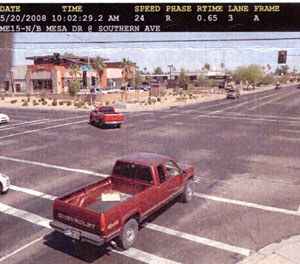 Twenty-two degrees replicates the angle employed by photo radar (radar speed vans). 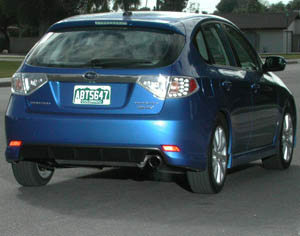 Violation photo of our Subaru WRX, its plate covered by an Original Protector. The license plate cover had no effect on our red light camera or photo radar. From experience we expected the plate covers to become effective only at a steep angle, well beyond that found in most red light cameras. Although a 35-degree camera angle is seldom encountered, it was included in the test to give the covers the best chance of success. Some of these license plate covers can be spotted from a distance and during the year-long evaluation, our testers were pulled over three times by curious officers. One, an unamused Arizona Highway Patrol trooper, wasted no words, "Your choice: either take it off or I'll cite you for an obscured plate," he growled. The ticket would have been an equipment violation, a.k.a. fix-it ticket, a no-points citation usually dismissed by the judge when proof of the corrective action is presented. Keep in mind that driving with some of these covers provides a cop with probable cause to make a traffic stop. But if you thrive on adversity or enjoy chatting with a uniformed gent wearing a gun and badge, don't let us stop you.